Sampling devices are used for taking water and sediment samples. They are necessary for ground- truthing and water quality monitoring applications. 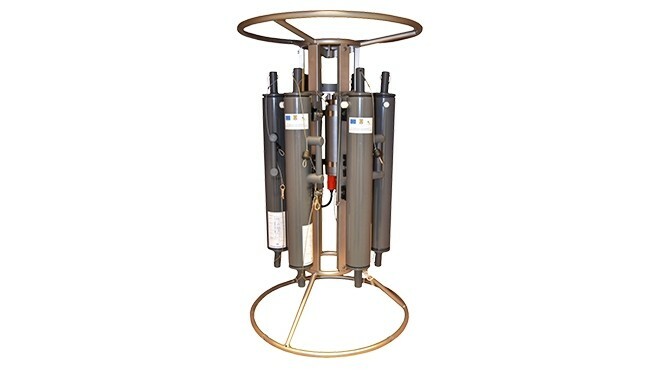 The Water Sampling Rosette is an oceanographic instrument dedicated to the collection of water samples from different water layers. It consists of a stainless steel frame equipeded with six 2.5 litres Niskin Bottles. The triggerring mechanism can work both controled from the deck and automatic pre-programmed by Ocean Lab 3 software. The electronics, with optimized power consumption, are designed for ambient temperatures from -40 °C up to +85°C. The maximum deployement depth is 3000 m.
The Van Veen grab is as simple as it is efficient. It is used for taking disturbed surficial sediment samples. It consists of a clamshell bucket made of stainless steel. We operate two models. The small one can grasp over an area of 250 cm2 and weights 5.5 kilograms, while the larger one grasps an area over 1000 cm2 and weights 25 kilograms. The Niskin bottle water sampler consists of a 2.5 liters plastic tube with two lids connected by a latex rubber tubing. The lids stay opened during descent and the device is triggered by a messenger dropped down from the surface. The Sediment Corer is used for retrieving undisturbed sediment samples. It is easy to handle. During the descent the plastic valve on top of the tube is kept open by the water flowing freely inside the tube. For recovery the corer is lifted from the bottom. The valve closes and the vacum inside keeps the sediment untouched. The sample is removed from the tube on deck for examination.